Project Description: Like many communities in the western Willamette Valley, water resources in Lafayette are relatively limited. This limitation results in the need for creative water supply strategies. Westech assisted the City of Lafayette with planning, design & construction administration for an aquifer storage & recovery (ASR) project. The project consisted of utilizing surplus wet season flows from a City spring source to recharge an existing City well and associated aquifer. The ASR system was designed and permitted through the WRD to store up to 460 million gallons per year of surplus spring water during the winter months for later withdrawal during the dry season. The project consisted of piping modifications (including valving and flow measurement systems) to divert excess water from an existing gravity water pipeline to the existing well site, while allowing unrestricted flow of water to the City reservoir during non-injection periods. The ASR system at the wellhead included both injection and discharge piping and valving to allow injection into the well or pumped discharge from the well without the use of surface actuated control valves. The system also included bi-directional flow measurement and totalization for tracking flows into and out of the well. 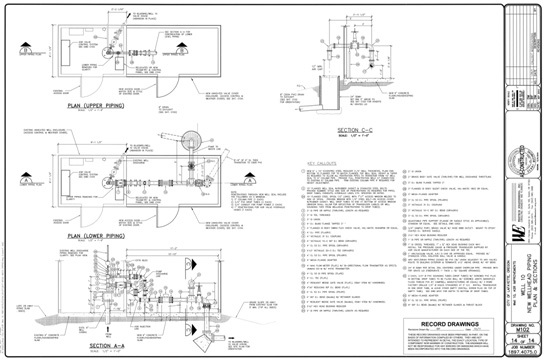 A down-hole injection control valve was designed for autonomous operation (remote control was limited to selecting whether the system was in “injection” mode or “discharge” mode) with fail-safe features to ensure that the well pump would always be available for use in case of emergency. The down-hole ASR control valve was hydraulically actuated utilizing food-grade hydraulic oil to protect the aquifer in case of failure of the hydraulic system.